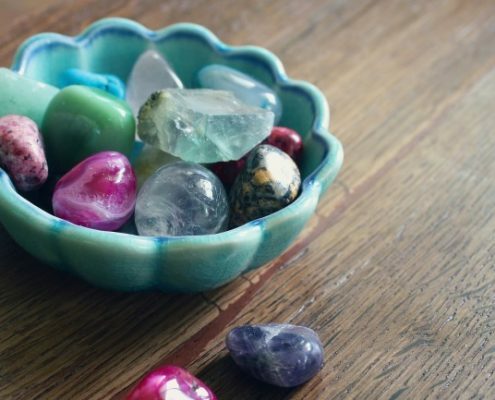 Confession time: I am a gemstone collector. Or at least I was one for a brief period of time in my life, as a kid! My parents would inevitably go on a trip and bring me home an aquamarine (birthstone) or something else unique that they found on their travels. As time went on, I found myself with a whole stack of gems: rose quarts, turquoise, amethysts, and garnets to name a few. Not really knowing what to do with them, I kept them safe anyways in a compartment organizer box that I would take out now and again to look at. But, to be honest (sorry mom and dad), I never really appreciated them or cared to find out their origin or additional information. I was lead to believe that every girl wants a big rock on her finger, but not a gemstone. And yet, up until recently I still thought of gemstones as almost fake rocks that mustn’t be worth much. While on a recent trip to Budapest, our limited selection of English language TV channels meant we didn’t have much to choose from for evening entertainment. One night we stumbled upon a show called Prospectors, which follows a group of miners as they try to strike it rich by searching for the rarest gems in select parts of Australia and the US. To be honest, the show is completely scripted junk TV. However, I will admit that it is slightly addictive. The only true educational part about it was learning how the modern day prospectors actually find gemstones. I can now say I have a huge appreciation for gems – how they are found as well as how they are formed. I love the fact that real gems, with all their intense coloring, are naturally formed in the earth. Hence why this article on gemstone engagement rings is now in front of you! “A gemstone (also called a gem, fine gem, jewel, precious stone or semi-precious stone) is a piece of mineral crystal which, in cut and polished form, is used to make jewelry or other adornments. However, certain rocks (such as lapis lazuli) or organic materials that are not minerals (such as pearl) are also used for jewelry and are therefore often considered to be gemstones as well. How Much Do Gemstone Engagement Rings Cost? To find the right price for your dream ring, the best advice is to shop around. And when it comes to gemstones, the variety of value definitely increases. Depending on the type of gemstone you’re looking for, expect a wide range of prices. Typically, rare or larger stones are pricier. This means you could pay anywhere from $100 to $10,000 for your gemstone engagement ring. ​More pricey gemstones include the more popular stones like high-quality diamonds, rubies, and emeralds. Cheaper and easier to find gemstones are often those listed as common birthstones, since these are already readily available as rings and mass-produced. Birthstone gemstones include varieties such as peridot, garnets, and alexandrite. The Archduke Maximillian of Austria gave the first diamond engagement ring on record in 1477. He had the ring commissioned for his betrothed, Mary of Burgundy. During the 1930’s, exploitation of African diamond mines flooded the gemstone market with diamonds. In response, jewelers designed an ad campaign to sell diamond engagement rings as the height of wedding couture. 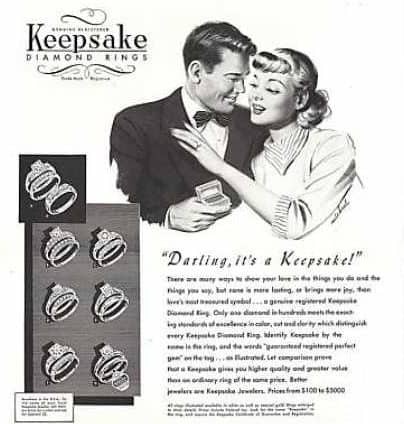 The marketing was one of the most effective campaigns in history, and couples began buying diamond engagement rings almost exclusively. ​Up until that time, engagement rings came in a variety of different gemstones. While diamonds are still the most widely popular gemstone in jewelry, many other types of gemstones are used. Sapphires are among the most popular stones, and are often used as a common alternative to diamonds. 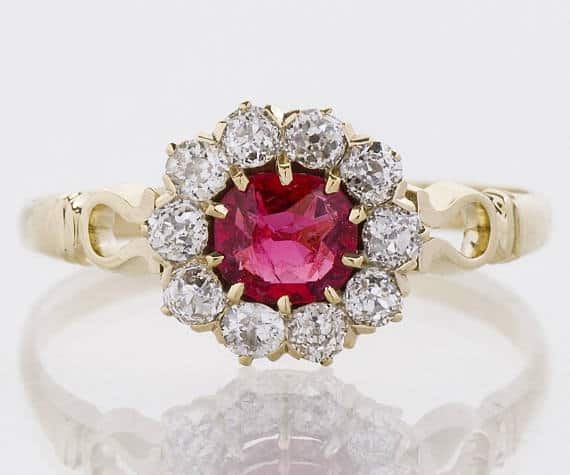 Rubies are valued as an accent stone, while purple amethyst have been used since ancient times for fine jewelry. Jade has dominated the Asian gemstone market, and onyx has become popular among those valuing a dark, unique statement piece. The largest cut and faceted gemstone in the world is the Golden Jubilee Diamond, weighing in at 545.67 carats, or 109.13 grams. The diamond was discovered in the Premier Mine in South Africa in 1985, where the last largest diamond, the Great Star of Africa, was discovered. For a truly unique look, rough diamonds and gemstones are the bohemian answer to their polished counterparts. These gems in the rough poses their own unique beauty that compliments those non-traditional brides with their own brand of sparkle. Bonus, rings like this are often considered non-conflict and are ethically sourced from the earth. Perfect for eco-conscious brides and grooms. 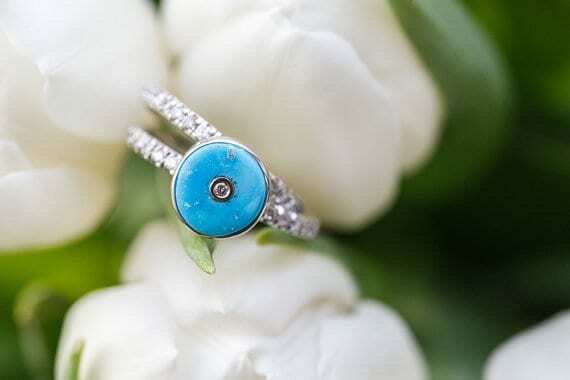 For a natural look, this turquoise ring is a perfect choice when trying to avoid the traditional styles. The soothing stone is set in a romantic diamond band, but breaks with tradition just enough to be unique to your own style. It’s not a sparkling stone, but it has it’s own magic in the deep, earthly light it captures and reflects. ​With just a smattering of diamonds to trim this ring, the focus is completely on the gorgeous bi-color Tourmaline center stone. The ring could be stacked with a simple wedding band easily. It’s standout cut, baguette shape, and bi-color is sure to turn some heads. 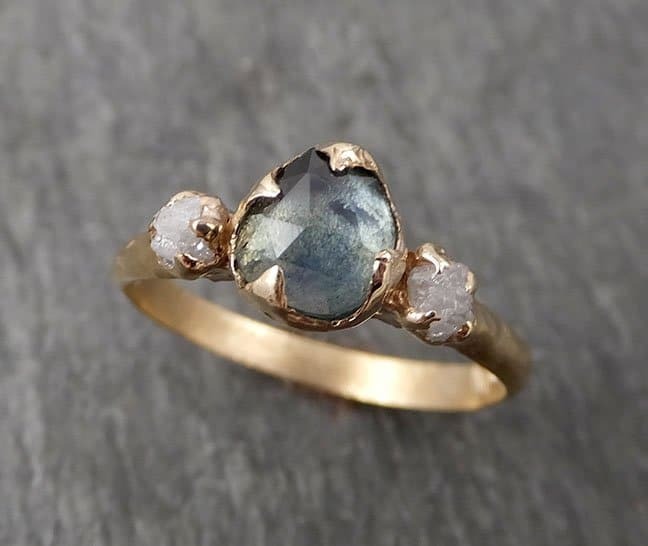 You might not think of such a unique stone when choosing your engagement ring, but give this creative twist a try on your finger and you just might change your mind. We can’t talk about unique stones without mentioning the lovely cintrine. 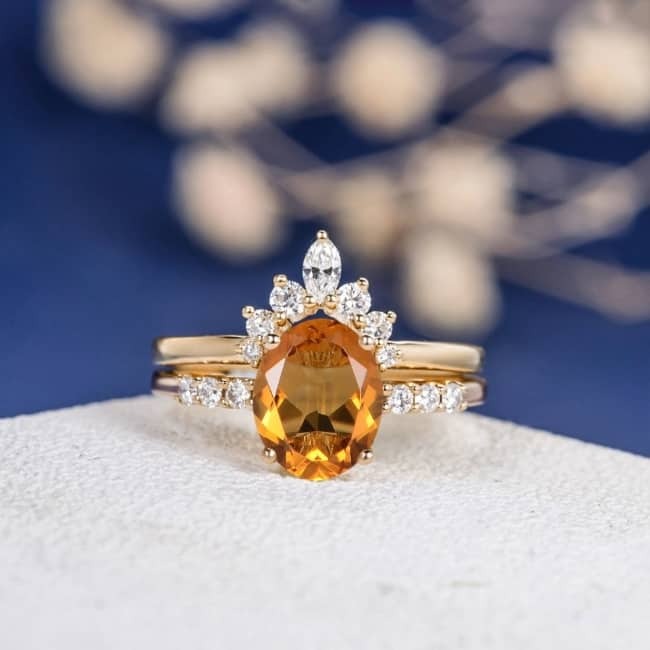 This gemstone is a fiery mix of pale yellow to brownish orange and seems to change in the light. This oval shaped stone in a 14-karat yellow gold band is a perfect example of the stone’s brilliant color combination. Fall in love with the multifaceted beauty of this gemstone in a sweetly unique designed setting that is ready to stack with your favorite wedding band. 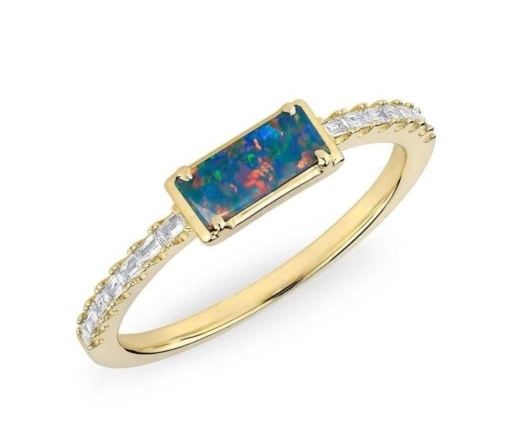 Opal might not be the first gemstone you think of when deciding on rings, but that might make it the most unique option yet. 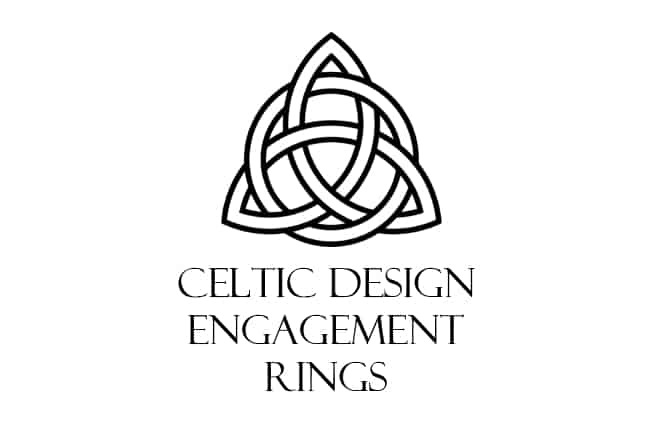 This ring will stand out as a modern answer to traditional settings. Complete with petite diamond crown to finish the look. It’s a chic looking stone that will standout from the mainstream styles you see in the stores. 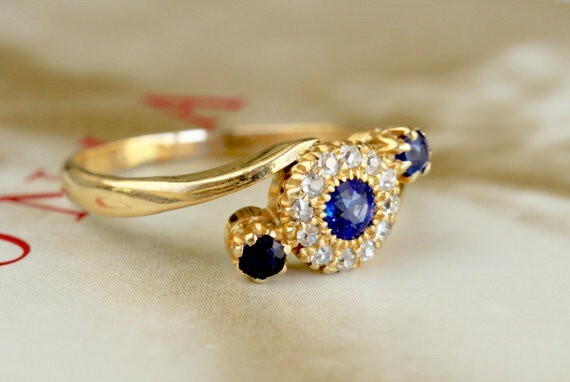 ​This vintage ring is a total showstopper. 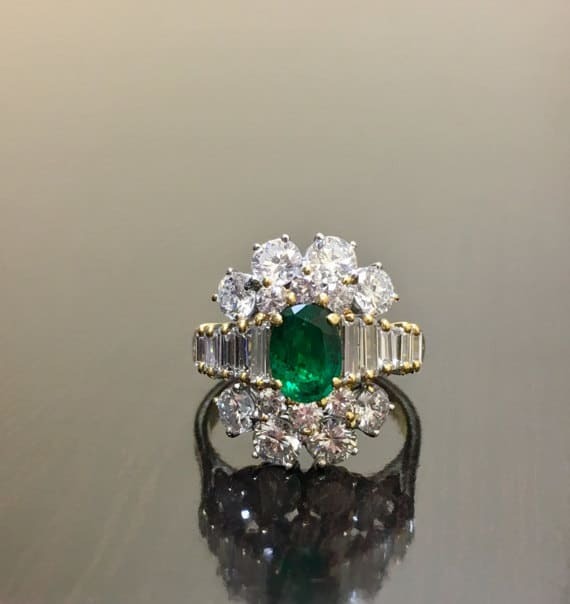 Set in 18-karat yellow gold with clusters of diamonds and a Colombian emerald at the center, it has all the class you’d expect from the age of golden Hollywood starlets. It might be a little difficult to find a band to match this interesting shape, but even on its own we love this vintage style. ​This ring looks like it came straight from the pages of a Jane Austen novel. This Edwardian sapphire ring features a .14-karat of deep blue sapphires surrounded by a halo of old European cut diamonds. 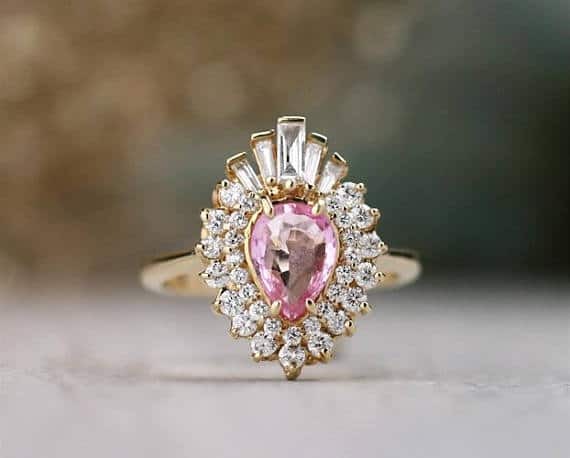 If Mr. Darcy came out of the lake to propose to you, he would probably use this ring. 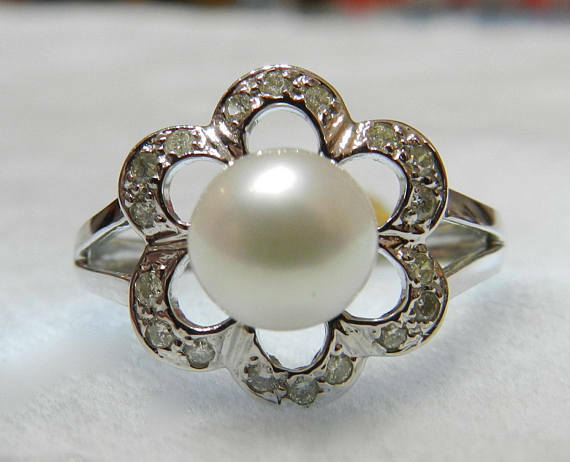 ​Beautiful in any color or combination, pearls make unique centerpieces in vintage rings like this one. While pearls are not technically a gemstone, they usually play the backup in most settings. Here it shines as the main attraction to a gorgeous vintage design. Bonus points if you’re a bride born in June since the pearl is also the birthstone of the sixth month. ​The geometric shapes and sparkles of this ring earn it the number four spot on our vintage ring roundup. The subtle twinge of blue in the central stone is ideal for brides who love diamonds but still want a tiny splash of color. It has that Great Gatsby look to it that would compliment a bride with a whimsical personality for all the years of your marriage. 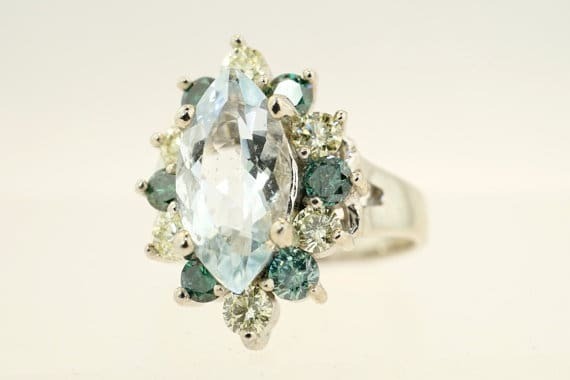 A flowering set of diamonds surrounding the gemstone give this ring a floral sweetness along with some serious dazzle. The dainty band could be coupled with a small wedding band as well, but honestly this style is a knockout all on its own. 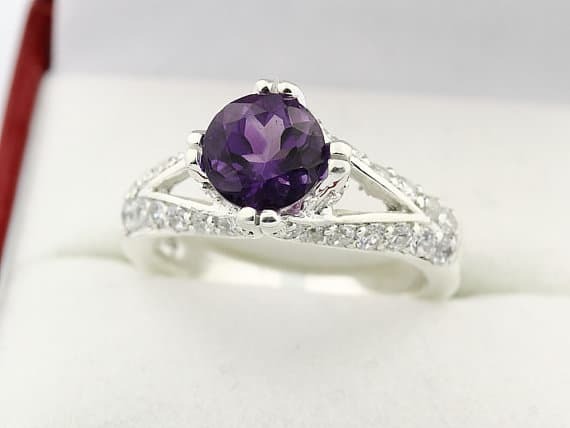 We just love the deep purple of the amethyst gemstone in this white gold setting. Choosing a colorful option like this might break from tradition, but the ring should reflect your own style. If purple is the color that sets your princess’ heart on fire, this ring is the perfect symbol of a love that never fades. The diamond sparkle on the band adds a touch of tradition as well. Pink is one of the more daring colors when it comes to choosing a nontraditional gemstone. This pear shaped pink sapphire is brilliant in its 1-karat gold setting. For brides who love bright colors and plenty of sparkle, this ring delivers all that and more. Pink sapphires are unique gemstones that will make your ring stand out in the crowd. Sounded by delicate round diamonds at the bottom and topped with a baguette crown, this setting drips with elegance and personality to match the most colorful brides. 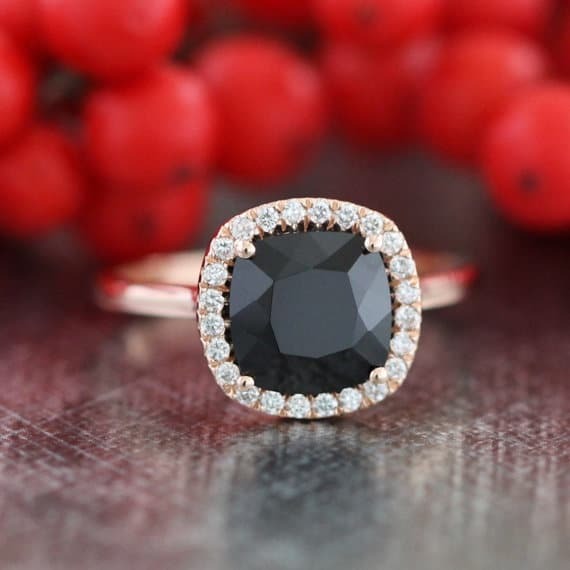 ​Black is probably not what you expect when thinking of potential gemstone colors, but black gems are proving to be extremely popular with more and more modern brides. This sophisticated beauty boasts a gorgeous stone in a 14k rose gold setting that offsets the dark black cushion cut Spinel at its center. 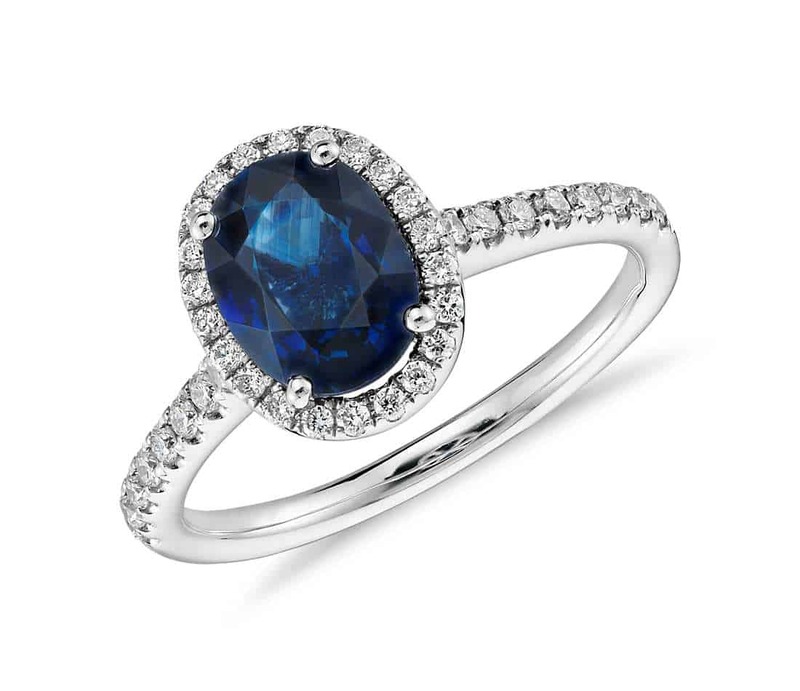 ​We definitely get serious Titanic vibes from this sapphire beauty. A traditional blue sapphire shines from this band surrounded by a halo of diamonds in a 14-karet white gold setting. Something about the deep shade of blue always calls to mind the image of royalty and decadence. If that sounds like just your style, this ring is for you. Rose gold is setting some serious trends among brides recently. Its romantic tones are perfect for setting rings that are made to stand out. If you want to break from the traditional gold and silver bands, this emerald cut tourmaline with off-set diamond detail and rose gold band is a creative way to show your style. The color combination of the emerald gem being such a dark stone paired with the romantic soft rose gold make such a striking color combination for a very special lady. Whatever style, cut, or stone you choose, a rock on the left ring finger should ultimately reflect the personality of the wearer. Don’t let long standing traditions make you shy away from choices that fit your own unique style. This is a piece that you will wear your entire life as a symbol of your one-of-a-kind love story. The only one who knows what that looks like is you! Gemstone engagement rings may not be to everyone’s taste, but if you like the looks of those items listed above, consider choosing one as a unique alternative to an world awash with expensive diamond gems! While pearls are not technically a gemstone, their widespread use in jewelry merits them a place on this list. Stunning diamond gemstones have long dominated the market for wedding rings, and probably always will. 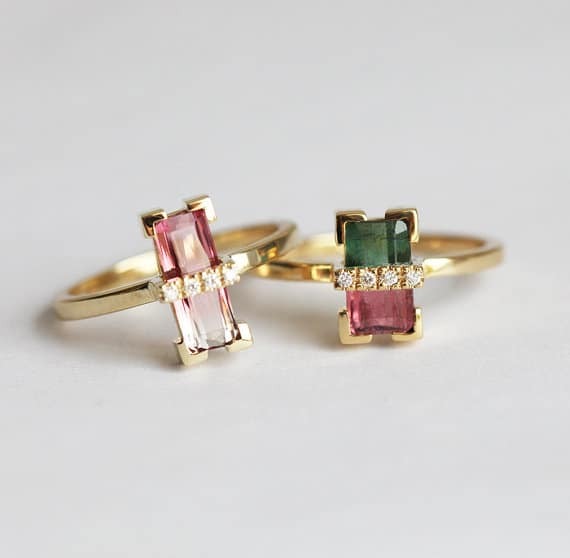 What I love is that varieties of gemstones are now making a comeback. 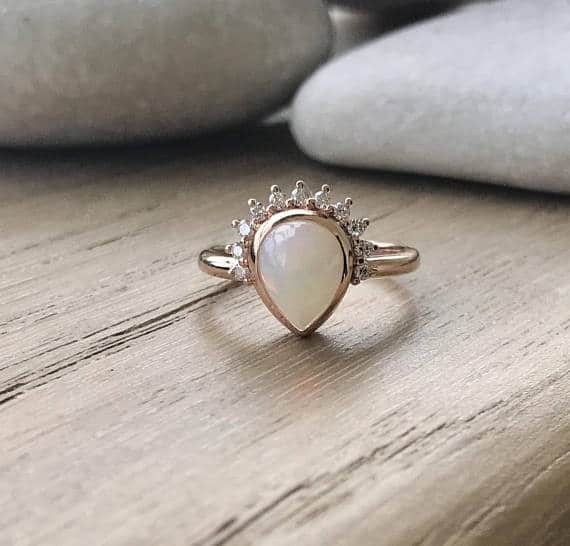 The unique looks and sheer endless color combinations and patterns of gemstones means many brides are buying rings personalized to their own unique styles and tastes. 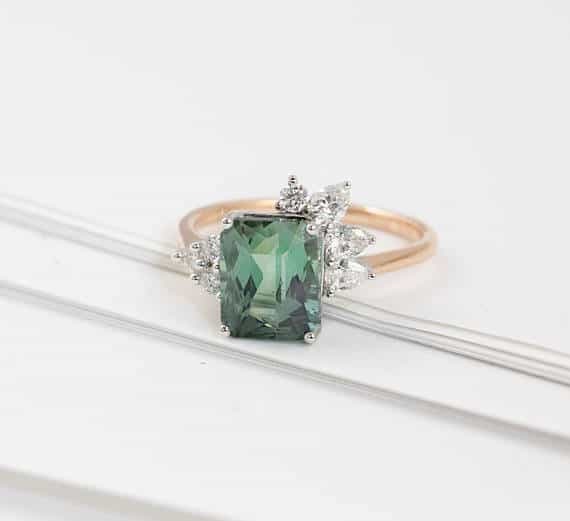 If you’re in the market for an engagement ring, or just dreaming of the future, we’ve rounded up all you need to know about this sparkling new trend of gemstone rings. Check out some unique, vintage, and colorful styles to fit every personality and learn how you can design a ring to fit your taste with classic gemstone flare.